I tried several ways to enter the timer to show the time remaining for the vote, but it did not work. can you help me? Thank you! All NorrCompetition themes display countdown timer, so this is just an advice since I noticed you can select the correct theme to get best result. 2. Caching and scripts optimization. I changed some params in the competition (options related to countdown) and had to remove cache to see changes on front-end. It might be not comfortable for you now since the site is under the construction. I guess the reason for why the countdown is not displaying on your site is the 3rd party extension which compresses the scripts. I see JCH Optimize and JotCache. Try to disable them to make sure the countdown does not display due to compression. If so, then you can try to add an exclusion for countdown script in JCH Optimizer settings. I deactivated the cache plugins, I cleared the cache, but it still does not work. Someone disabled countdown settings in the competition and enabled cache….. At least, the pages still caching. I had to clear Joomla cache to see changes at the front-end. 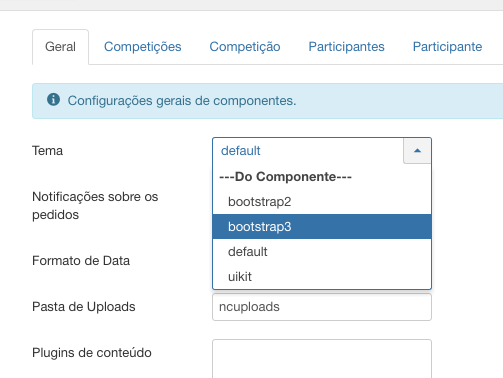 I tried to disable some of your extensions and assigned Protostar template and checked the first competition, but since I do not understand Brazilian Portuguese, I could not find that countdown timer params are disabled. So, it took about an hour on examining your site, but it was waste of time because of changed params and cache. 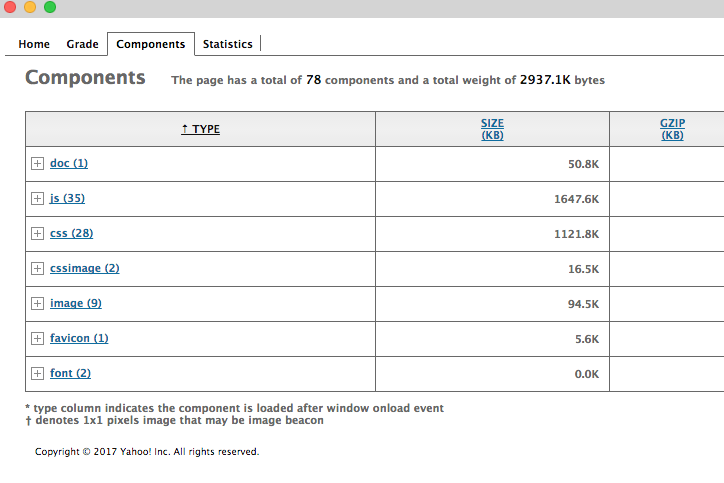 Your page has a total weight of 2937.1K bytes. There is a scripts conflict. You need to find what causes this conflict by disabling 3rd party extensions. Last edit: 1 year 5 months ago by Eugene. Sorry, I had to inform you I am going to test the site. We misunderstood each other. Well, let's back to the problem. As we can see, the page loading about 1,6mb of scripts. It is too heavy. 1. Turn off any cache to make sure you can see the changes without clearing the cache. Disable any script optimizer. 2. Assign the default template like Protostar. Make sure Jquery library is loaded. 2. Disable each 3rd party extension and check out the front-end each time. In this way, disabling each 3rd party extension consistently you will find what causes this issue. Thanks, but really I do not have much time to test all these things. 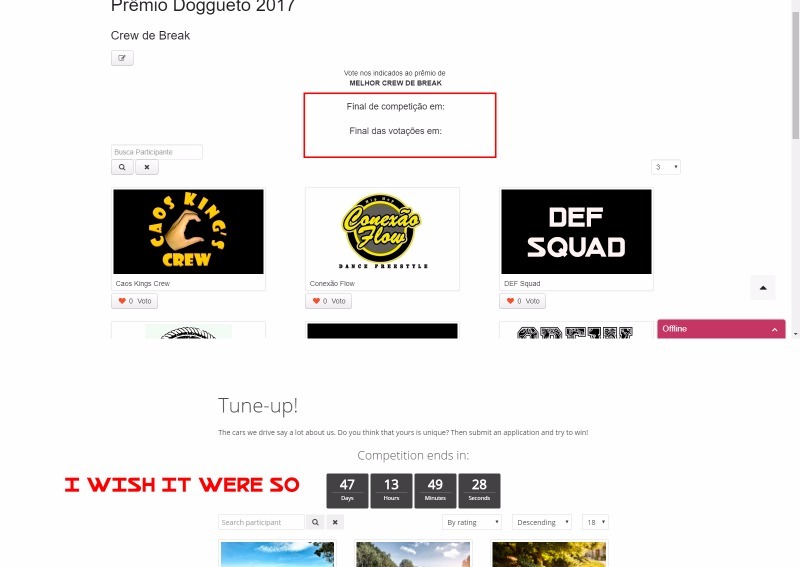 This site is a shop that is already online, only the competitions are being configured. I still have to finish this today. I'll leave the timer for another time. Although it is very interesting, it is just aesthetic and what I really need is to create an option to go back to the competitions page, as I reported on another topic. Thank you very much for this ... If I get some time, I'll try your suggestions to solve the timer problem. Oh, TinyMCE purges the URL. I have added https://[domain].com.br/premio2017, but it saves the URL as premio2017 which cause 404 error due to the wrong URL. It seems there should be a special param in TinyMCE settings related to URLs. So I'll try with other editors. Thank you!